London’s lively Soho area, perhaps best known for it’s thriving nightlife, is quickly becoming the food mecca of the capital. Whilst the East End may lead the way when it comes to column inches, this maze of streets boasts some of the best lunch spots in the city. Burgers, as they have the last few years, still drive punters through the door though and the competition here is flipping fierce to say the least. So what sets BRGR.co out from the rest? The Joint: BRGR.co, 187 Wardour Street, Soho, London, W1F 8ZB. You can find their website here. 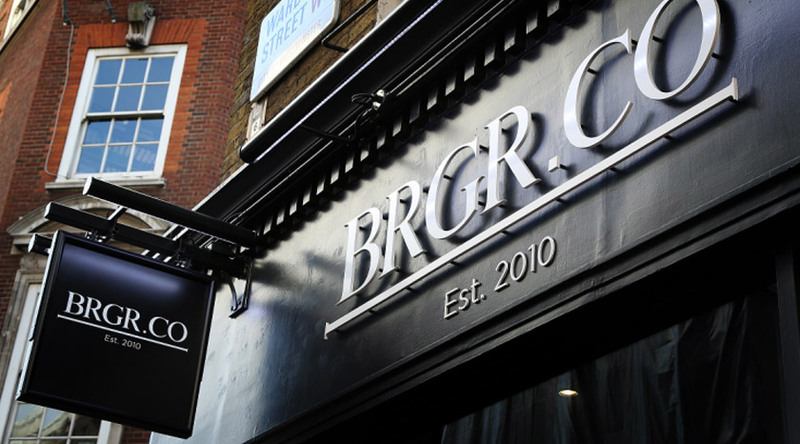 The Vibe: Perched on the corner of Wardour and Noel Street is BRGR.co’s well styled joint. Originally from Beirut, but with a heavy Manhattan flavour, this location has been their London base for a number of years and offers simple but well presented burgers. However it’s not their glorious 8oz beef burgers we’re writing home about today. In an attempt to liven up the average Soho burger menu BRGR.co have introduced a fun and tasty Burgerlicious Afternoon Tea menu. 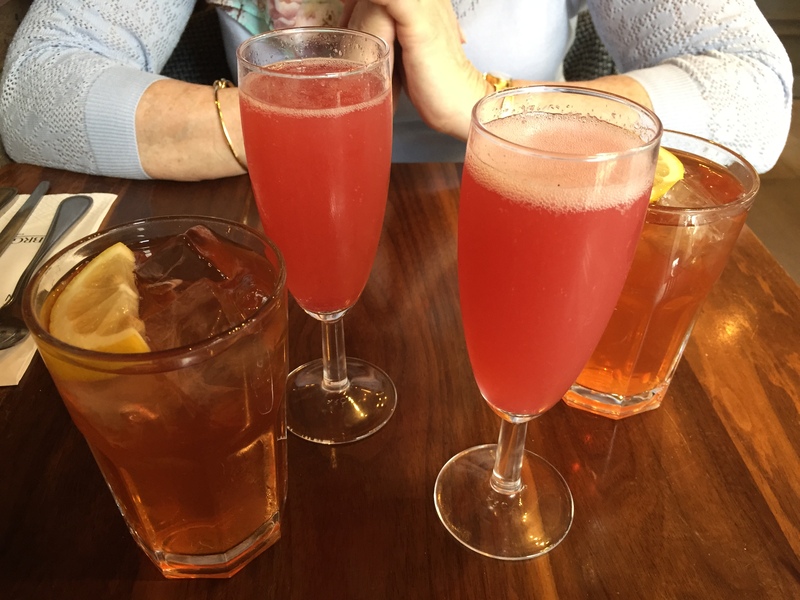 As soon as you’ve sat down you’re treated to a glass of Bellini (Prosecco mixed with fruit purée), a mason jar of homemade iced tea, and a mini vanilla milkshake. It’s a great starting point and certainly beats the usual can of fizzy drink you get on most menus. 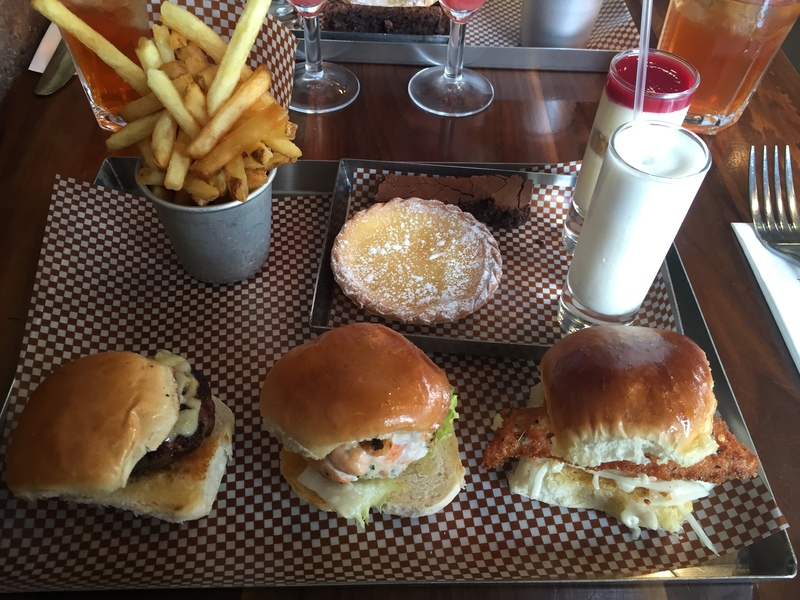 You’ve then got three burger sliders to munch on – beef and cheese, southern fried chicken & coleslaw, and prawn & salmon. Whilst small to look at they taste huge and combine nicely with the side of tiny fries. 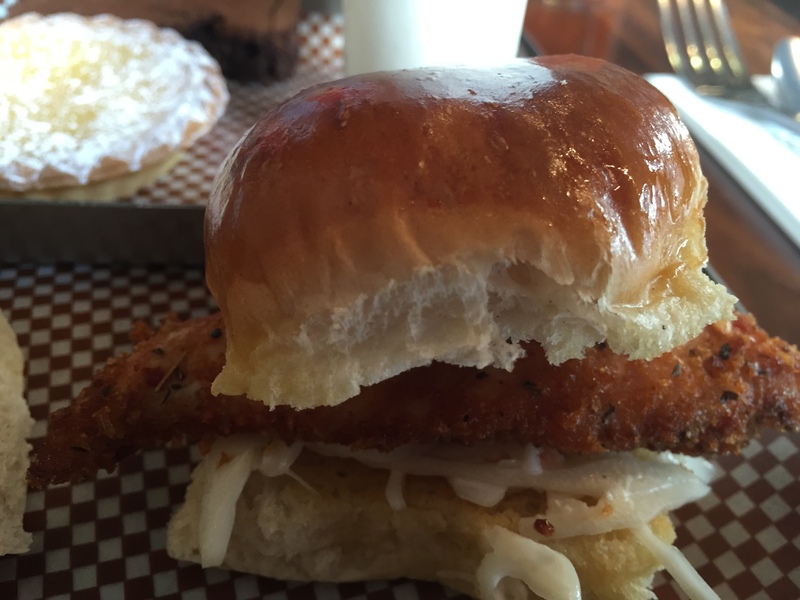 Having previously sampled one of their 8oz cheese burgers we can assure you that the mini versions are just as good. To finish your afternoon tea a trio of desserts spoils you. 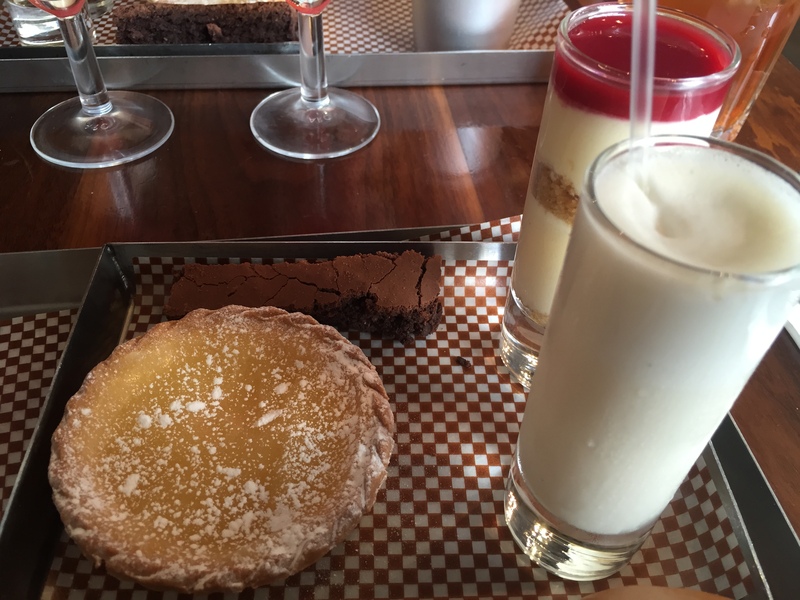 You’ve got a sharp lemon tart, a creamy raspberry & white chocolate cheesecake, and a crunchy chocolate brownie. BRGR.co’s burgerlicious afternoon tea menu is a fun festival of food and a great way to spend an hour in the capital. The Price: £17 per head, which is relatively cheap for afternoon tea in London with alcohol thrown in. BRGR.co was visited by Tom in May 2015. 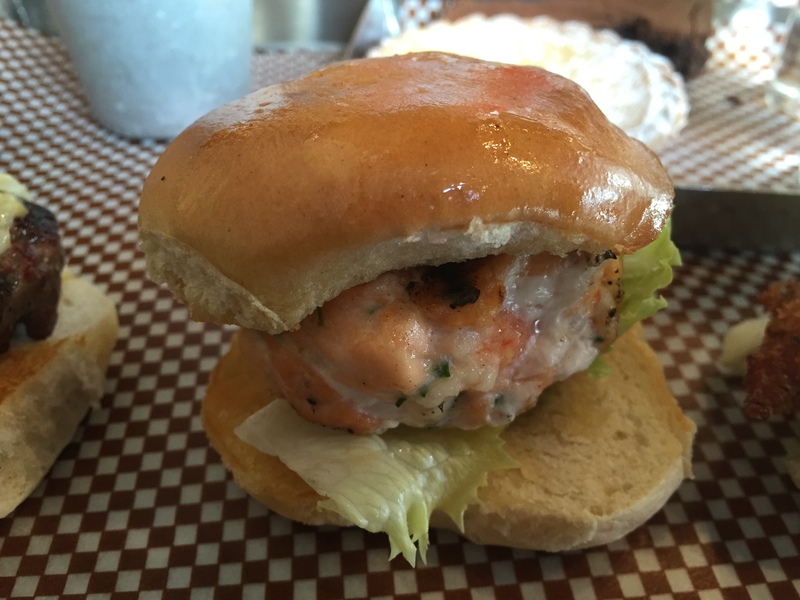 Posted in LondonTagged bellini, brgr.co, brownie, burger afternoon tea, cheese burger, cheesecake, chicken burger, Food, food blog, iced tea, lunch, milkshake, salmon burger, sliders, soho, soho london, wardour streetBookmark the permalink.